This year’s prayer vigil will begin at 9:00 pm on Good Friday (April 19) and end at 6:00 am on Easter Sunday (April 21). You may sign up for more than one slot, but only one person per time slot. Sign up here for your time to pray! When setting up your prayer area, you may want to have a Bible, a songbook, church roster, and a candle to light during your prayer time. Encourage your children to join in praying for their friends, teachers, and anything else that might be on their mind. “He will swallow up death forever. The Sovereign Lord will wipe away the tears from all faces;” (Isaiah 25:8a). Holy Week begins with a joyful and triumphant entry into Jerusalem. We are expectant of great things, but the week quickly turns in an unexpected direction. Jesus is betrayed, arrested, beaten, and killed. His followers are left in silence wondering where to turn, but Easter Sunday comes, bringing with it joy and victory in new life. This month we have been singing “Resurrecting” a song by Elevation Worship* in the contemporary services. 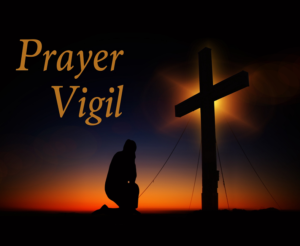 As you pray through your half-hour vigil slot, spend some time focused on the following lyrics, scripture, and prayer prompts, or feel free to simply pray as Jesus leads by the Holy Spirit. Now at His feet we bow. Now shines for all to see. God came close to save us (Matthew 1:21). Spend some time in repentance and thoughtful contemplation of Jesus’ sacrifice. Praise God for His perfect love. Slowly inhale and exhale allowing yourself to sit in that love. As Christians, indwelt with the Holy Spirit, we never face our days alone (Romans 8:37-39). Meditate on areas of your life where you currently feel fearful or alone. Release these situations to Jesus asking Him to exchange any fear with Peace. All praise, will rise to Christ, our King. From the ashes of defeat. The resurrected King, is resurrecting me. So much of the world can be defeating and debilitating. Every day, people on this earth battle depression, anxiety, cancer, addiction, poverty, war, loss. Easter morning Jesus rose from the grave declaring victory over the ills of this world (1 Cor. 15:57). We are invited into a partnership with Jesus to pray His victory into this world (Isaiah 62:6-7). Lift up friends, family, co-workers, neighbors, countries…any situation that the Holy Spirit places on your heart where encouragement, new life, and victory in Christ is needed. Pray for a fresh outpouring of the Holy Spirit to rest on the Christian Church bringing blessing, renewal, and workers for the harvest (Matthew 9:37). Pray for the church: Pastor Sean, Pastor Greg, Pastor Rob (and their families) and the church staff (and their families), the church council and other ministry leaders. Pray for individuals: Pray for each person as the Holy Spirit leads. Helpful Scriptures when praying for others: Colossians 1:9-12, Ephesians 1:15-23 and 3:14-21, Philippians 1:9-11, and 2 Corinthians 1:9-11. Pray for Our Community – Our Country – Our World: Pray for our schools, school boards, teachers, local government leaders and their families, the state representatives and assemblypersons, national congressmen and representatives, President Trump and his family, as well as other world leaders. *”Resurrecting” by Elevation Worship Songwriters: Christopher Brown/Wade Joye/Steven Furtick/Matthews Thabo Ntele/Mack Brock. “Resurrecting” lyrics copywrited by Sony/ATV Music Publishing LLC.